The automobile accident attorneys at Hollis Wright have years of experience representing individuals and families that have been injured and victimized by an automobile accident. Our attorneys have very diverse backgrounds and all come from different parts of the State of Alabama. Their individual backgrounds and different geographical roots have resulted in a statewide automobile accident practice. 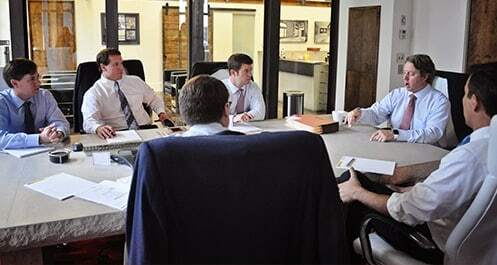 The Alabama car accident attorneys at Hollis, Wright, Clay & Vail, P.C. have practiced and/or handled automobile accident cases in every state circuit court in Alabama as well as all of the federal courts. The attorneys have years of experience investigating, settling, litigating and trying these types of cases. If your case is worth more money than what the automobile insurance carrier is offering, then our attorneys will continue to prosecute your case and go to trial, if necessary, to obtain the just compensation that you deserve. Alabama driving statistics from the Alabama Department of Transportation demonstrate that about 95 percent of all automobile crashes are the result of driver error and/or driver behavior. These errors have become even more prevalent due to the use of mobile devices while driving. Approximately 25,000 teen drivers are injured annually in Alabama and about 100 teenagers die each year in automobile crashes. In excess of 125,000 automobile accidents tragically occur annually, including almost a 1,000 deaths. Obviously, as a society we will never be able to prevent all automobile accidents but through education, awareness and perhaps tougher laws and higher fines, we can reduce the number of accidents and save lives. If you or a family member has been injured or killed in an automobile accident, it will undoubtedly be one of the toughest experiences and difficult times in your life. Don’t make a mistake of carelessly choosing an inexperienced attorney to handle such an important legal matter. Trust the Birmingham accident attorneys at Hollis Wright to handle your case. Our attorneys are experienced, trusted and well-equipped to handle any type of automobile or motor vehicle accident case. Our attorneys and investigators are available to completely and thoroughly investigate the facts and circumstances of your accident in an effort to determine what happened and maximize your recovery. If you have been injured in an automobile accident, then contact us now to protect your legal rights. If the accident was not your fault, then you are entitled to compensation for medical bills, lost wages, pain and suffering, emotional distress, permanent scarring and disfigurement.